"SWRnewstar have added value with store data / insights and general operational support with projects such as the regional waste toolkits." 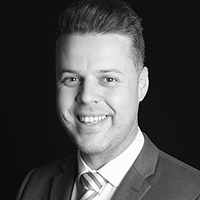 Rob joined SWRnewstar in 2015; previously he spent 13 years working in the retail food waste sector managing high profile accounts. He specialises in innovative solutions which permanently remove commercial spend and maximise commodity rebates. At the same time Rob has built strong commercial partnerships with the Anaerobic Digestion and Animal Feed markets, whilst supporting partnerships with food donation charities.